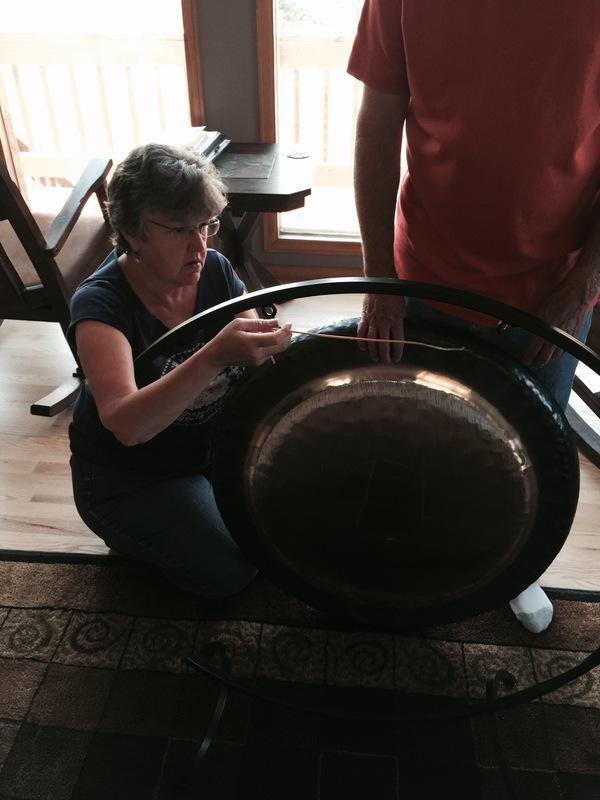 Since we first stepped into our Colorado home, over a year ago, I have pictured a gong in the main room. That isn’t everyone’s first thought, I suppose, but there was just something about the space. Our nice wooden floors and high ceilings, a view of the mountains…what else could be needed? A gong, of course! But as we refreshed things with paint, wood, and tile, the cost of a gong seemed too much to think about. We finally made our move to the house from California last July. One August morning, my husband told me that my three-year-old granddaughter had a surprise for me. She did indeed! They blindfolded me and brought me into the living room where this little one rang the gong for the first time. I was in shock! They had taken me completely off guard. I stared in awe at the beautiful symphonic gong that hung in my living room. It was just like my beloved friend and teacher, Shanan’s, gong. It gleamed there in the sunshine with its beautiful circular rainbow of metal around the rim. And then, I suppose you would assume that I began to play? But I did not. I was truly overwhelmed and felt inadequate. I was at a loss to know how to begin. I dabbled for a few minutes every now and then, but then put the mallets back on the shelf. It would come in time I was sure, but I had no idea when or how. It is unfortunate that the first instructional YouTube video I watched began with a warning by a spiritual teacher – a sound healer – saying that if you used the gong in the WRONG way, you could do damage to those listening. Oh no! Now I had reason to be intimidated. To make a long story shorter, it took three months. I stared at the gong. I thought about it. I wondered how to begin. And then, yesterday, I assembled my little stool, my singing bowl, chimes, a rain stick, mallets and my wonderful gong. I began to play. I finally understood that if it was approached with respect and sacred attention, there would be no wrong way to play. An hour or so later, I felt as if the forces of the universe had initiated me as a gong player, a sound-healer-to-be. And today, I experienced my first healing session! I was in an irritable and impatient mood – a little bit out of sorts after spending a morning on the laptop filling out forms. I sat down in front of the gong and grounded my energy and made my best attempt to set my irritability to the side. The gong vibrated and sounded deeply – sometimes fast, sometimes long and slow, wave upon wave of sound – a deep, metallic “OM.” Gradually my breath became peaceful, my thoughts calm, and my mood shifted. Wow! There is something mystical and awesome about this calming, healing sound. So now, if I only share this gift with myself and my family it will be enough. But I have the feeling that this is the beginning of a beautiful friendship and an opportunity to share the waves (good vibrations) with others. It is interesting to watch what gets in the way of us owning our power, our connection and knowing. Fear, self-consciousness, inadequacy, and so on. When we finally step into the light – relying on the forces all around us that are assembled for our good – the magic happens…at last.